Richard Burbidge is the UK's leading manufacturer and supplier of Stair parts, Decking balustrades and Decorative Mouldings. They use high-quality materials, combining them with great design and the finest craftsmanship for beautifully produced products. 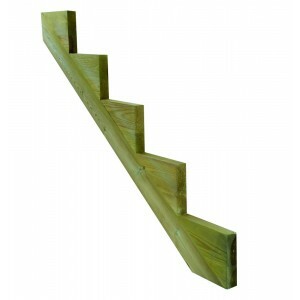 These softwood cut strings for steps and stairs are treated for use outside. These parts are designed to make your garden exciting this summer, and for many years to come, with fantastic new decking. For slightly raised decking you may require steps up to the deck and these stair parts will help you produce this.